When you are binding data there are additional properties that allow you to format the display and to handle errors and null values. The StringFormat property allows you to add any standard .NET format string that matches the type you are binding to. The FallbackValue instructs the binding on what to display if the binding fails. The TargetNullValue instructs the binding on what to display if the value bound to is null. Notice that all three TextBlocks use the identical properties except for the name of the property that it will bind to. Notice that PromisedDate returns a date, there is no property for DeliveredDate. amd ReturnDate returns null. In the body of Main we’ll instantiate a Book object and set as the page’s DataContext. 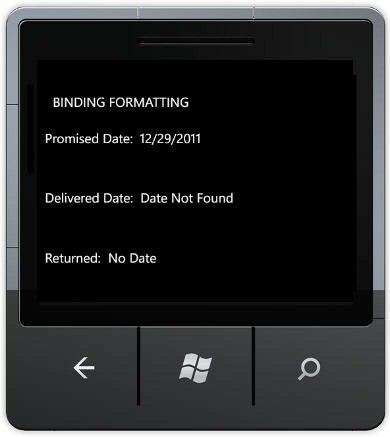 When this is run, PromisedData provides a date which is formatted by the StringFormat property. Because there is no DeliveredDate the binding on that property fails and the FallbackValue is used. Finally, because ReturnDate is null, the TargetNullValue is used for that value. The output is shown in the illustration at the start of this posting. This entry was posted in Data, Essentials, Mango, Mini-Tutorial, WindowsPhone and tagged Mini-Tutorial. Bookmark the permalink. The setter in PromisedDate will cause an infinite loop. Yes, you are right, stupid mistake. That property needs a backing variable.